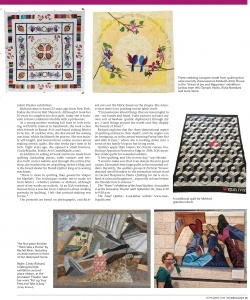 The December issue of Art Quilting Studio has just been released and I have a two-page spread in the magazine. It’s a high-quality quilt art magazine. Worth a look! 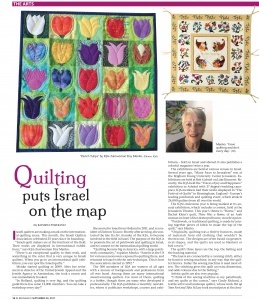 The Jerusalem Post weekend supplement, In Jerusalem, featured an article on 20 September 2017, “Quilting Puts Israel on the Map.” The article discusses the Israel Quilters Association and also quotes Elsy Menko, the chairwoman of the organization of quilters in Israel. 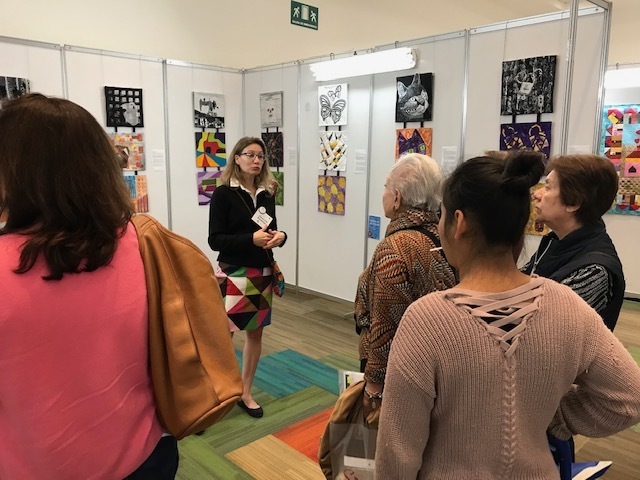 In addition the article discusses the current exhibit, “Home,” which is showing for a few more days at the Jerusalem Theater. 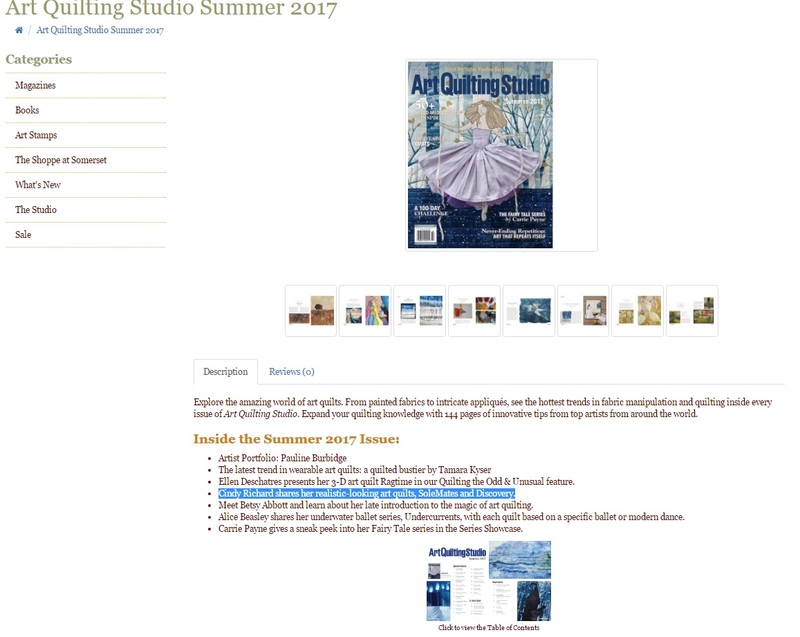 A portion of the article is devoted to interviewing me as well and a photo showing my 2nd place winning quilt is included in the article. “Put up Your Feet and Take It Easy,” is a quilt showing my family members lounging in our living room together. Family is the epitome of Home for me! I find feet to be particularly expressive and this is the second quilt I have done involving feet that won a prize. The first quilt, called Sole Mates, is a quilt of my daughter and son-in-law as they stood together at a family gathering. 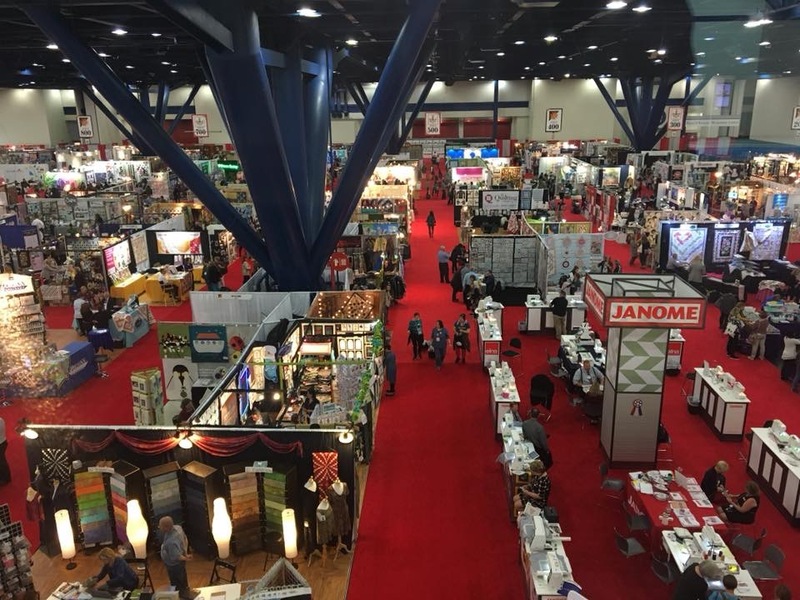 Sole Mates is showing early November at the International Quilt Association 2017 exhibit, “Hands All Around” in Houston. The article is also available online if you have a subscription to the Jerusalem Post daily e-paper. 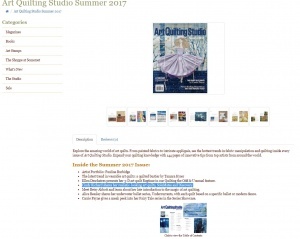 Art Quilting Studio just released their Summer 2017 issue and I have a featured article in the current magazine. It’s so exciting to see my work in print and to share my techniques. My article contains photos of “Sole Mates” and “Discovery”. 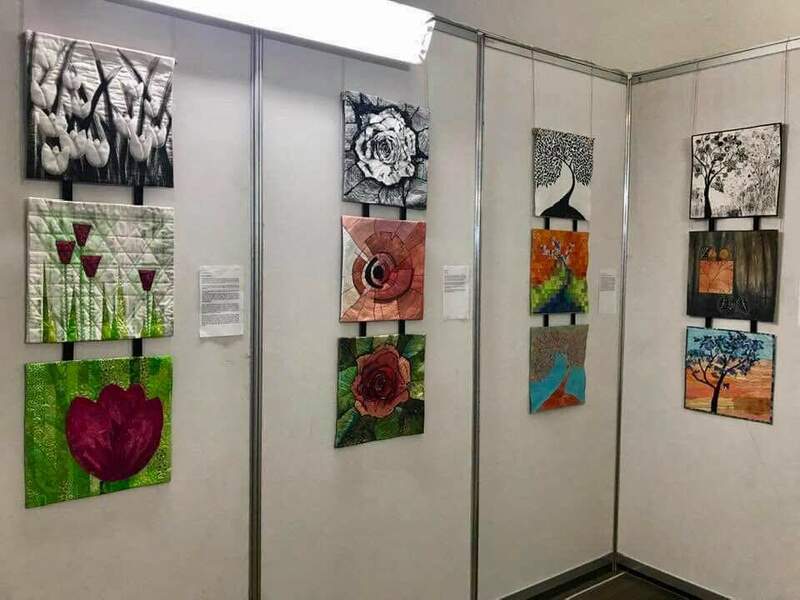 These two pieces have won prizes and have been exhibited internationally. 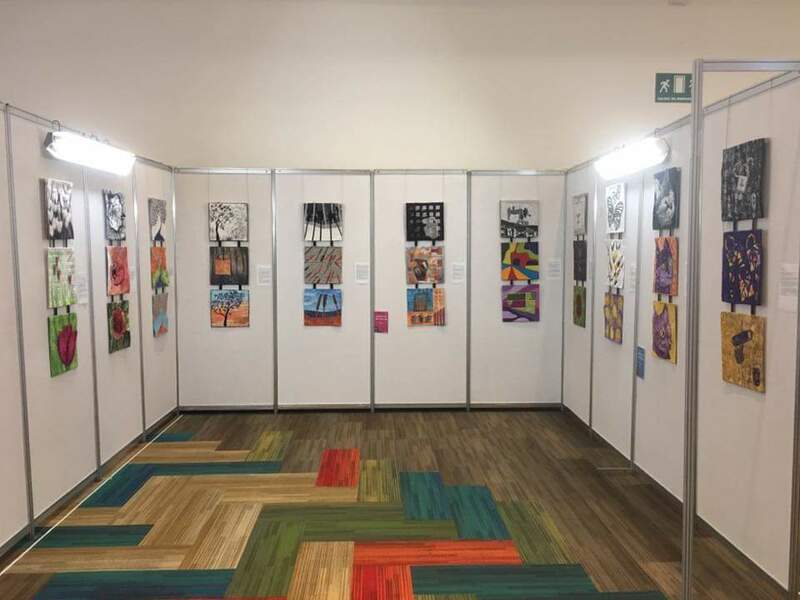 “Sole Mates” will be showing in the International Quilt Festival in Houston in November 2017. “Discovery” is currently part of a SAQA exhibit in Europe. This series of six quilts was made as a commission for someone who plans to hang the quilts along her spiral staircase. It was the best commission ever! I took the photos and she chose the ones she liked best. 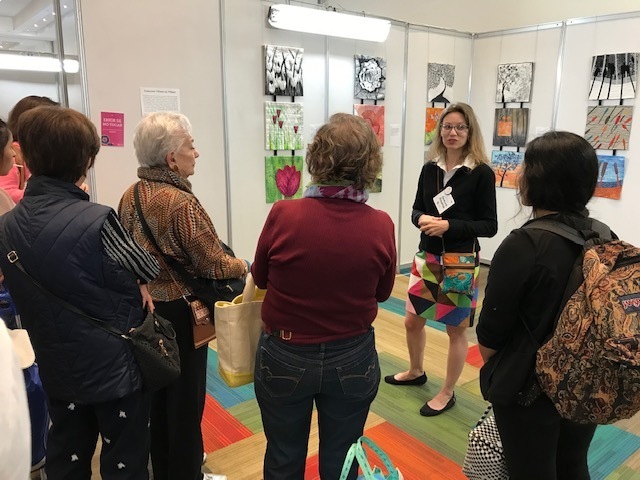 Each quilt is the same size, 12″ x 22″ and bordered with the same fabric. But that’s where the similarity ends! They are all beautiful places in Israel — that’s why I enjoyed making them so much! 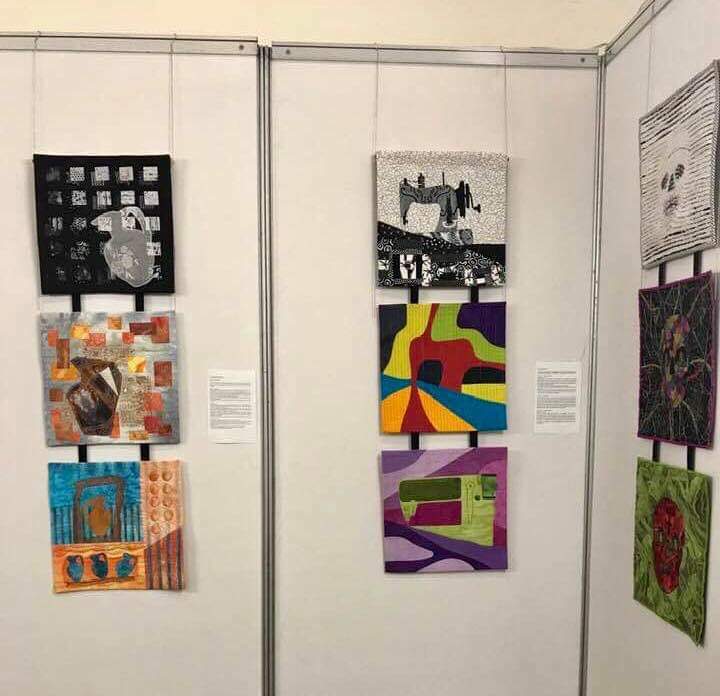 “Opposites” quilt exhibit, Jerusalem theater. I called it Sole Mates. She sat on his lap. She was elegant and careful about her outward show. He wore baggy pants and scoffed up shoes. They were opposites in their appearance but they were attracted to each other because opposites attract. They were soul mates and also “sole mates”!